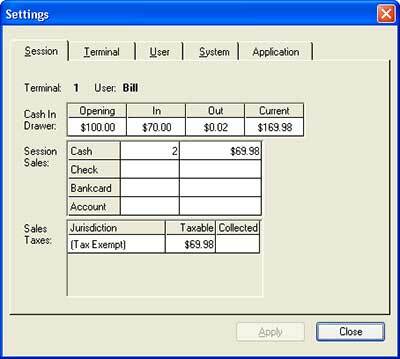 Replaces a retail cash register with a full-function computer; processes counter sales with the fewest key strokes possible, still allowing any operations possible with a standard computer station (including Internet access and any other application); includes streamlined database inquiries (inventory and accounts receivable for example). Note: This application, perhaps more than most, sends a lot of information over the network at the end of the sale. With a single terminal and a network server doing nothing else, this is not a problem. However, as the number of terminals goes up, the demands made to the network increase significantly, and it's important to use a powerful server, one with more than just a minimal configuration. On the other hand, the longest delays we've observed between sales is one to three seconds. 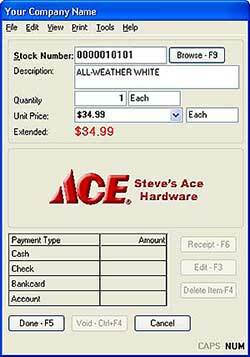 Sales checkouts with as few key strokes as a cash register, and. . . When the application launches, it will open two windows, one for the current item and sales totals. . .
. . .the other with a copy of the current receipt. The window at the left is for entering sale information. 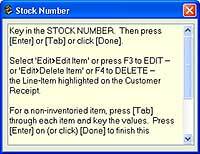 You can key in a stock number or scan a bar code, and the application retrieves the description, price, and other information from the database. If the sale quantity is one and there are no other changes, you just press Enter, which is right next to the numeric keypad on most keyboards. 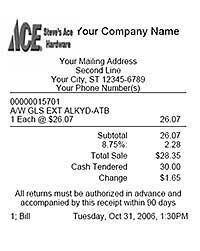 The facsimile of the receipt shows all the information, just as it will be printed. 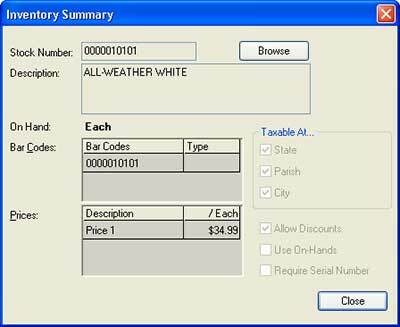 After the Stock Number or Bar Code, the cursor automatically moves to the quantity box, so if you want to ring up more than one of the item, just key the number, and press Enter. Or, you can press Tab to move to any box for other changes. After pressing Enter, the cursor comes right back to "Stock Number" (or "Bar Code"), ready for the next sale. Need to change a previous item? Just press F6 and move the highlight until it's on the item to change. Press F4 to delete the item; press F3 to change any part and press Enter to return to the flow of the sale. When you've entered all the items in the sale, just press F5 or Enter on a blank stock number. The payment grid in the lower-left portion of the main window will open. Just key in the amount of total cash tendered and press Enter. 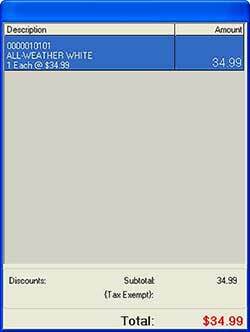 The final receipt totals will display in the receipt window. Not a cash sale? Move the highlight down to the sale type. Press Enter if there's no "cash back" or other change, and Point-of-Sale will prompt for the appropriate information for credit cards, house accounts, and so on. Of course, you can split sales across as many types of payments as you like. Press Enter again, and the customer receipt will print and the cash drawer will open. We can include business logos and format however you like. Of course, you can change the message at the bottom at any time. At any time between sales, you can review totals for the current session by just selecting File>Settings. You can even retrieve previous sales! PressF12 or select File>Sales Journal and you will see a window like this. You can select a previous sale from the same session or even from previous ones -- even previous days! 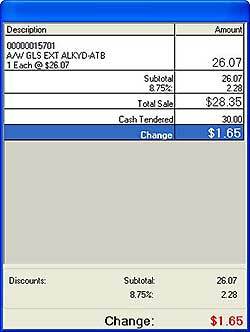 You can click Reprint if the customer needs another copy of his receipt. You can click Retrieve to retrieve the entire sale, and you'll be right back to where you were at the end of that. This is especially helpful for refunds or returns. Just retrieve the previous sale and select As Credit, and just press Enter to complete the transaction. Just press F7 (or select File>Inventory Summary) at any time to see the key information on an item. Just press F8 (or select File>Account Summary) at any time to see the current balance and other information on a house account -- or to print a Statement. 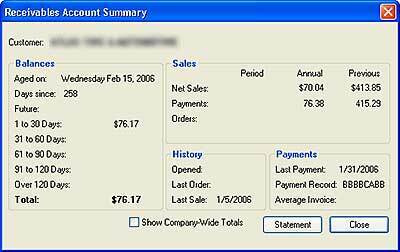 Includes all the features of a complete Accounts-Receivable (house accounts), so the application will alert you when a customer is about to go over his credit limit. You can even enter special instructions that will "pop up" for a customer. The application can maintain a database of mailing addresses independent from sales accounting. You can add customers to it as they check out, including coding that lets you create groups within the list for following up in the future. While you're leaning the application, it can display a small window prompting you through each step. It can also display a template showing the assignment of the function keys that put everything right at your finger tips.